A new range of 1/300th scale buildings laser printed in full colour on good quality 160gsm card. Designed to be easy to build and using realistic textures these make an economical and lighter alternative to resin models.  Each set comes on a number of A4 sheets laser printed in full colour on good quality 160gsm card. 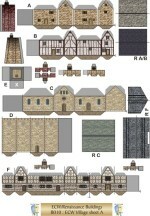 Each sheet contains a number of complete buildings. Designed to be constructed quickly and without needing to be an experienced card modeller these do need some care but will repay the effort with interest. 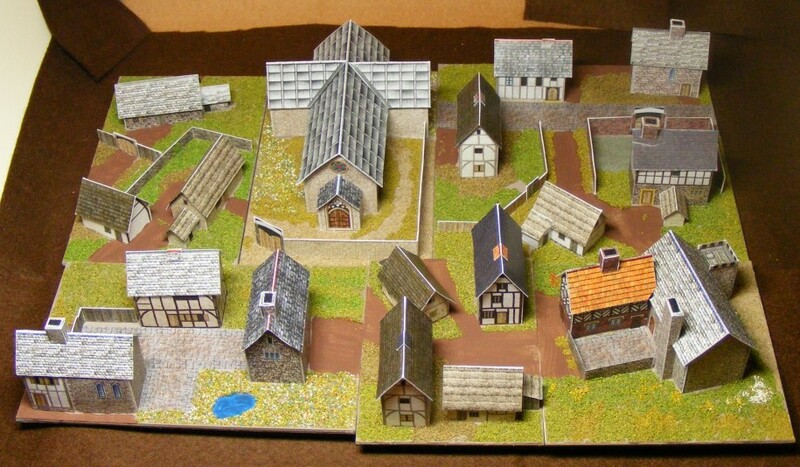 You can get a whole village for the cost of a single resin model ! Full instructions are included and further hints, tips and basing ideas will be available here shortly. Like any card model they are less sturdy that resin or metal but by no means 'delicate' and they will stand careful use for a long time. 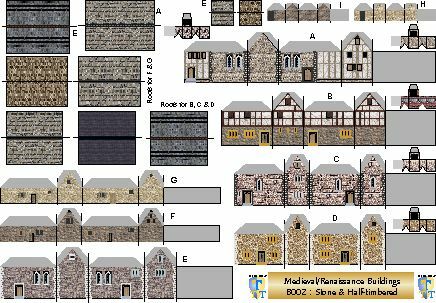 There is a shipping/handling charge of £1.00 on each order for buildings, ship counters and flags (except the Sample packs which are post free) delivered within the UK, no matter how many packs are purchased. All orders are sent Second Class post or Airmail, in a card-backed envelope so that your order reaches you in perfect condition. Customers in Europe will need to pay a postage supplement of £2.00 per order of flags or card models. Customers with an address outside Europe will need to pay a postage supplement of £2.60 per order of flags or card models. 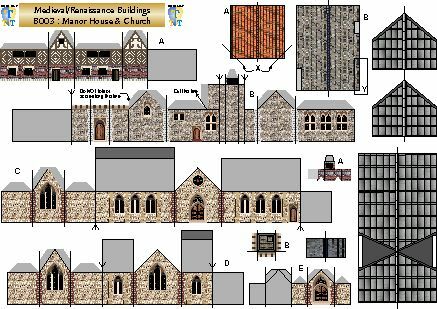 Each sheet contains all the parts needed to make up a number of different buildings, including additional details such as chimneys, lean-to sheds and outhouses. On each sheet are a variety of roof textures so that you can mix and match some roof/wall combinations to give even more variety. 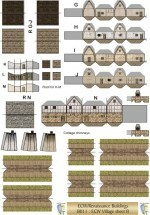 3 sheets [B004-006] of buildings, bases and enclosures (walls, fences and embankments). 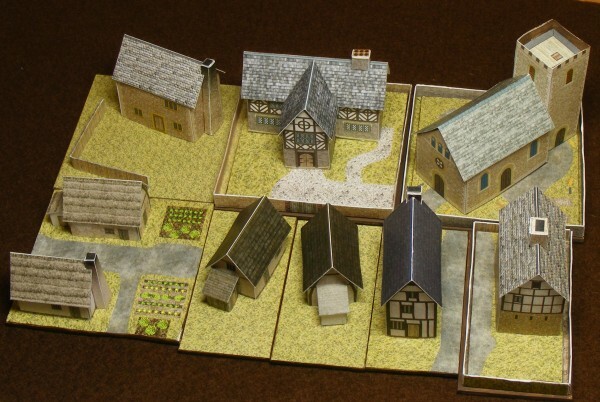 A total of 9 buildings, each with full colour base and enclosure. 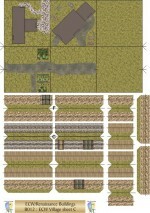 This set is designed to fit onto 60x30 & 60x60mm bases to be compatible with the many rule sets that use this base size. Each base also has a set of enclosures so that the building can be removed and replaced with a base of troops. 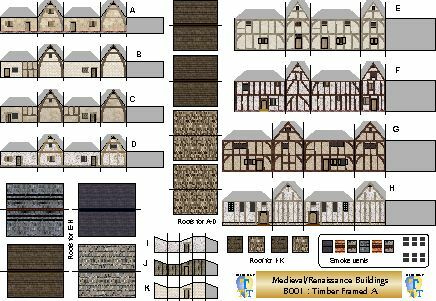 3 sheets of buildings [B001-003] plus a full sheet of walls, fences and roads to enhance your based buildings.